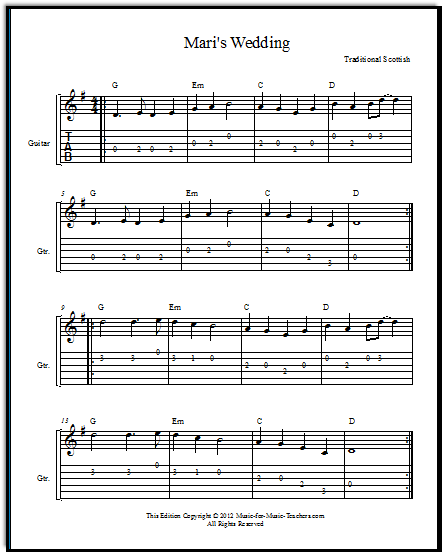 Free fiddle sheet music "Mari's Wedding" (also known as "Mairi's Wedding") is a traditional Scottish song for fiddle and guitar. Download two versions with easy guitar tabs for your students, and A NEW ARRANGEMENT with lyrics for singers! The High Kings is an Irish group, singing a Scottish song. This song has a repeating, predictable, and yet engaging tune that even beginning singers can pick up easily. As you can see above, I doubled the timing for the sake of beginners who do not read well. I have a few young students who struggle with timing, and this approach works with them. This cute Scottish song uses the same guitar chord progression as "I Love the Mountains": G - Em - C - D (or D7). This is a great exercise for beginner guitar players just starting the "big" G and C chords... I like to set a goal of playing this set of chords with eyes closed, moving from G to Em, then C and D7 with one finger down on the guitar neck at all times (a different finger with each chord). 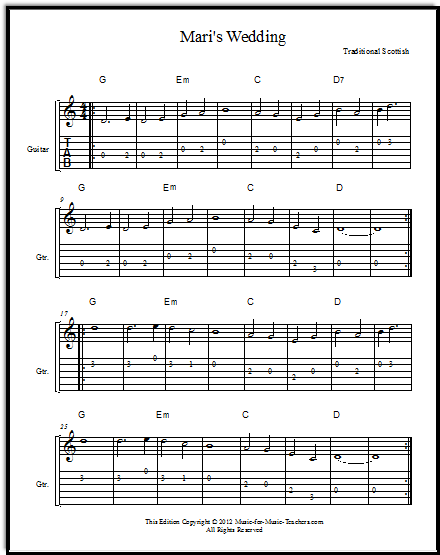 Below is the easy-to-read version of the free fiddle sheet music Mari's Wedding, with double-time notes for beginning fiddlers and guitar players. I have found that beginning players do very well counting rhythms in this manner that would otherwise be beyond their ability. If fiddle and guitar want to play together, but the guitarist wants the fun of flat-picking, then have your beginning violinist drone on the chord tones, using a single note. Softly! For those teachers who may be unfamiliar with violin techniques, that just means the fiddler will stay all on one note, drawing the bow for the duration of that harmony. Measure one needs a G chord, so it is easy to "drone" on the open G string. On the next chord, Em, have the violinist play finger one on the D string for the E drone, not the open E string, which is high and far away from the previous drone note. Some of my students (part of a group called "The Fiddleheads" here locally) played Mari's Wedding as the second half of a medley, the first half being "Swampwalk" from The American Fiddle Method Book 2. The two pieces are a nice contrast to each other, and were a hit at the Alaska Folk Festival we participated in (I got to play the bass!). 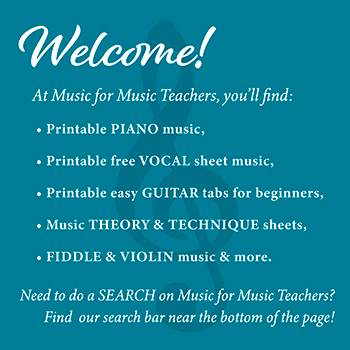 Your students will enjoy this free fiddle sheet music, whether they play fiddle, guitar, or mandolin!